FANBOY PLANET.com . 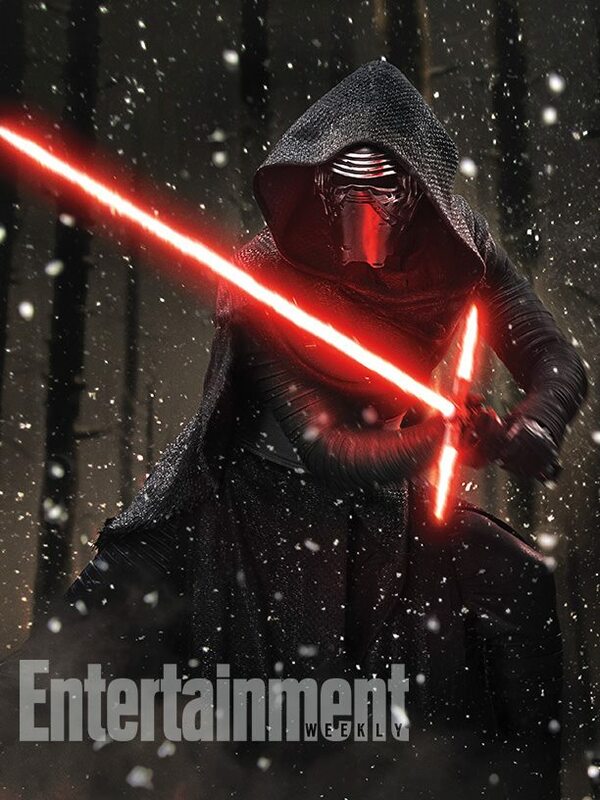 : EW-The Force Awakens Pictures :. 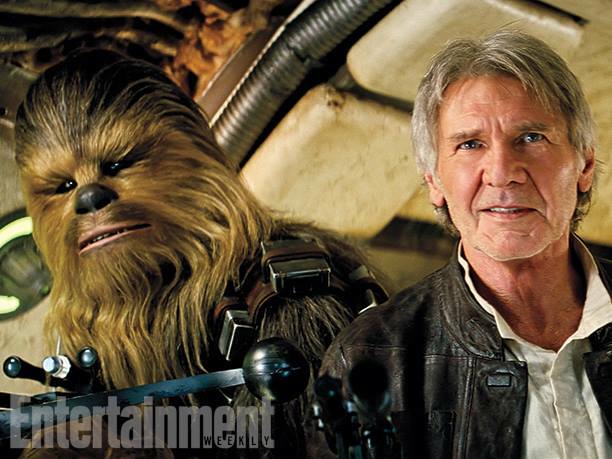 The venerable Entertainment Weekly has new shots from The Force Awakens in this week's issue -- just in time for D23 in Anaheim this weekend, where no doubt MORE will be announced and released, including rumors of how Star Wars will affect the Disney parks. Right off the bat, we know Star Wars is nothing without its villains -- and Adam Driver as Kylo Ren is driving fans crazy in design and desire. The only apparent Heir to the Sith this time around, we do have to wonder -- does he have a connection to the Skywalker clan? 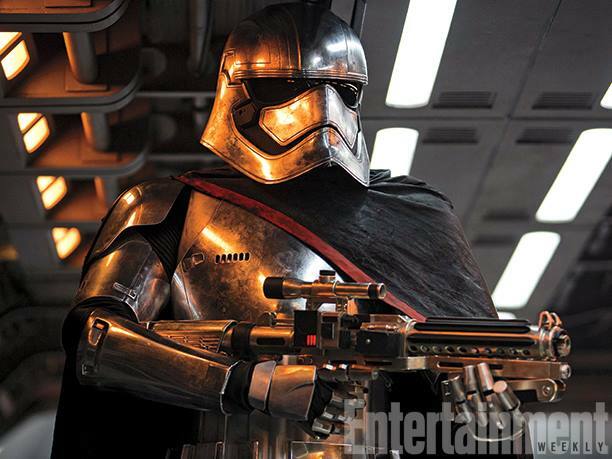 Gwendoline Christie (we assume) as Captain Phasma, a leader in the First Order, or are we just assuming? Unfortunately, there's a meme going around the 'net pointing out that the First Order helmets look a lot like a Donald Duck sketch, and now I can't shake it. 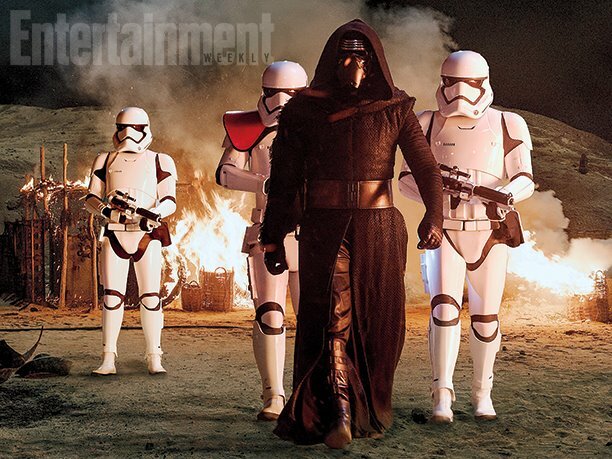 Kylo Ren and First Order Troopers burning down a small village on the desert planet of Jakku. Notice that the Troopers' tactics haven't changed much from A New Hope. I suspect that J.J. Abrams will have more than a few nods to the events in that film echoing throughout The Force Awakens. 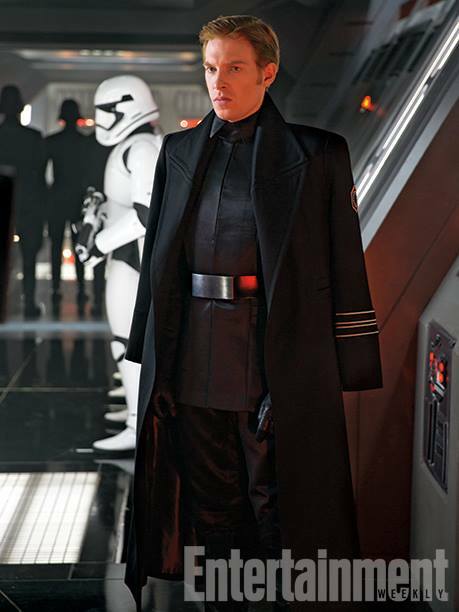 Click for the full panoramic splendor of General Hux overseeing his troops at a Killstation on a planet that is not Hoth. 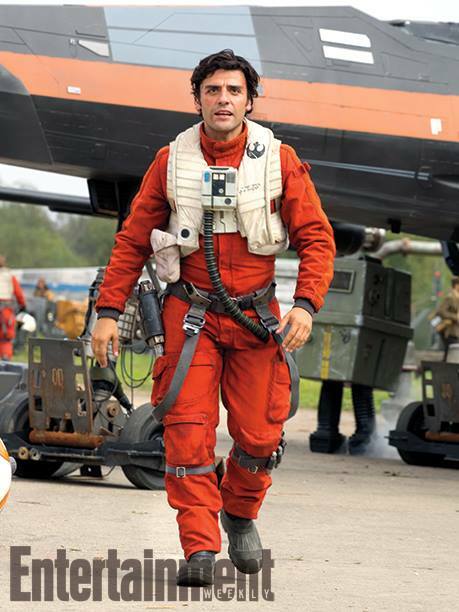 And how about the heroes... X-Wing Pilot Poe Dameron (played by Oscar Isaac). Not to get wild with speculation here, but IMDB does have him listed as already cast for Episode VIII. OR DO THEY? 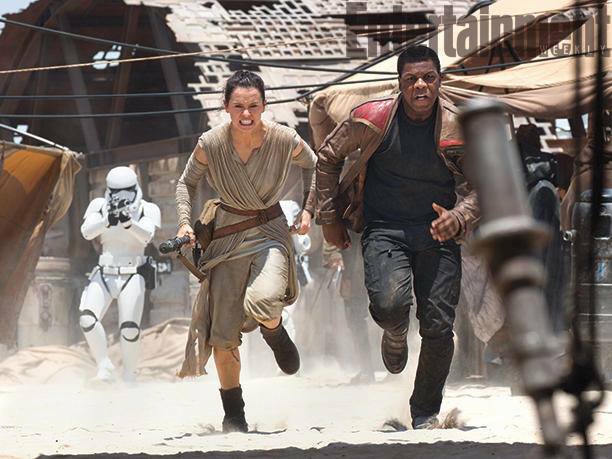 Rey (Daisy Ridley) and Finn (John Boyega) fleeing First Order attention on Jakku, which is not Tatooine. 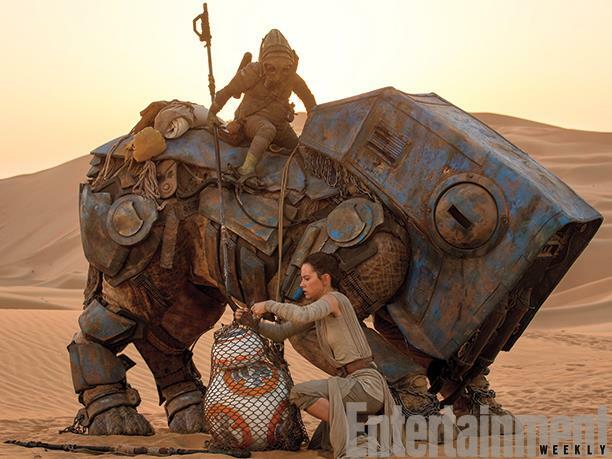 Rey encountering BB-8. But all our attention is on the creatures behind her. This shot more than any other hammers home -- this is what we remembered and loved about the original trilogy. It's visceral, it's dirty, and it feels truly lived in. 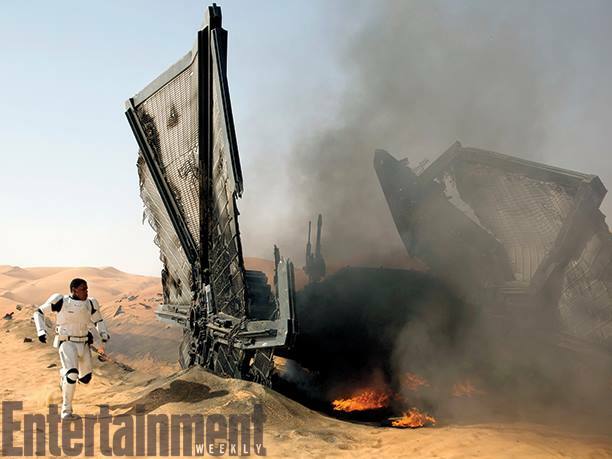 Finn running from a crashed TIE Fighter. And yes, it's actually there. 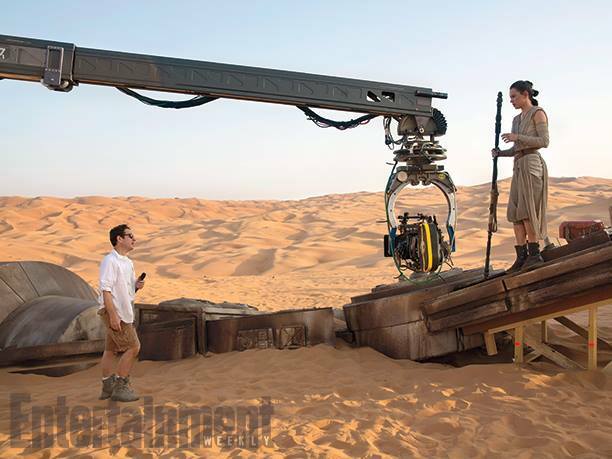 JJ Abrams and Daisy Ridley on the set. See? It's real. There is no truth to the rumor that JJ stands for Jar Jar. 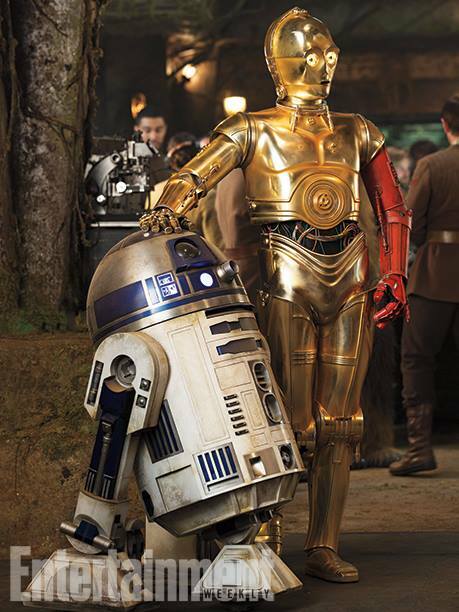 Entertainment Weekly calls attention to the red arm on C-3PO, but he's had a silver leg before, too. It may simply be more a reflection of wear and tear and the difficulty of getting good quality replacement parts these days. The thing to remember most is that it is once again Kenny Baker and Anthony Daniels in those suits. This seems right out of the trailer we've already seen, but yes, we're home... almost. 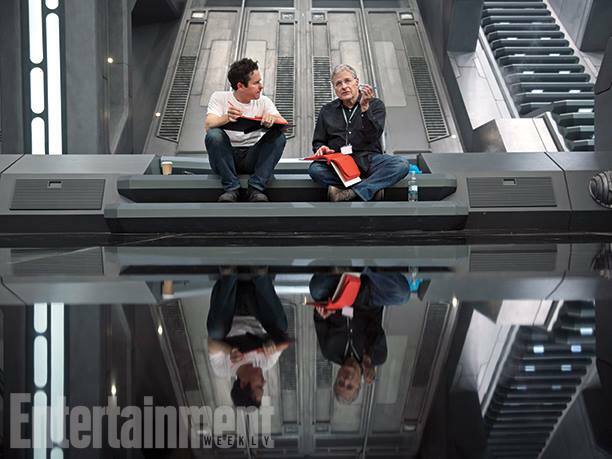 Here's the man who's really home -- screenwriter Lawrence Kasdan, sitting on the set with JJ Abrams and holding a dark red colored script -- it's dark red to combat piracy by making it hard to copy. These secrets will be told only when Abrams and Disny are ready! You can hear our interview with Lawrence Kasdan here.